If you want to lose belly fat, you need to combine a reduced-calorie diet with physical activity. You can’t spot-reduce any specific area of the body, like the stomach, by exercising only that area. Cardiovascular activity, like running, will burn calories, however, and help you lose unwanted fat all over, including from your midsection. Combine running with strength-training sessions to burn more calories and shed belly fat more quickly. Losing stomach fat through running requires you to create a calorie deficit. This occurs when you burn more calories than your body needs — resulting in fat loss all over, including your stomach. A fat-loss goal of 1 to 2 lbs. a week is healthy and reasonable, according to the MedlinePlus online medical encyclopedia. For a 1-lb. weekly weight loss, you need to trim at least 500 calories daily through diet, exercise or a combination of both. For a 2-lb. weekly weight loss, you need to burn 1,000 calories daily. Since running is a high-calorie-burning activity, it’s possible to achieve these goals — and thus lose fat from your stomach and elsewhere — by running every day. How many calories you burn while running depends on your body weight and the intensity at which you exercise. The more you weigh and the faster you run, the more calories you burn. For example, a 160-lb. 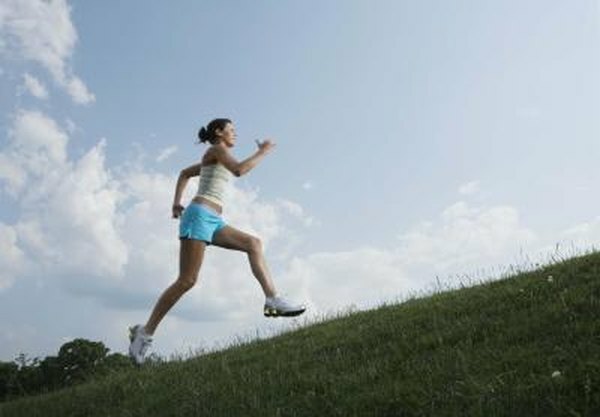 woman burns 584 calories in a hour of running at 5 mph, according to MayoClinic.com. A woman who weighs 200 lbs. burns about 728 calories running at the same speed for the same time. Increasing the pace to 8 mph, meanwhile, will burn 986 calories for the 160-lb. woman and 1,229 for the 200-lb. woman. You can also flatten your stomach while running with a circuit-training approach. Start out with a tummy-toning exercise, like abdominal crunches, then alternate to running for a few minutes. Rotate between a new belly-toning or other strength-training exercise and running for at least 30 minutes. According to "Fitness" magazine, circuit training burns 30 percent more calories than a traditional strength-training approach. If you decide to use a circuit-training approach to lose unwanted belly fat, you might wonder which core exercises are effective at toning your stomach — and your toned stomach will be more noticeable if you lose weight by running every day. Try the abdominal hold, which targets your lower stomach. Sit on the edge of a firm chair, feet planted firmly to the floor. Place your hands on the edge of the chair. Lift your feet off the ground about 2 to 4 inches and hold the contraction for a few seconds. Release and repeat the exercise for a minute. Another effective core exercise to use with circuit training is the squat with twist. Start out with your feet spread about shoulder-width apart. Lower into a squat position, extending both arms to shoulder height. At the bottom of your squat, twist your upper body to the left, then return to a standing position. Repeat this exercise eight to 12 times on each side of the body.